15/12/2018 The last hope of this splendid Ulsterman was granted. Mortally wounded by a shell storming the enemy position in a wood during the great advance, he was removed to Dieppe Hospital, where he lived long enough to hear the news of the great victory, and then he passed away quietly. The R.I.C. and the Army are poorer for his loss. 01/07/2018 Constable William A W Boyd, who is a native of Mabuoy. 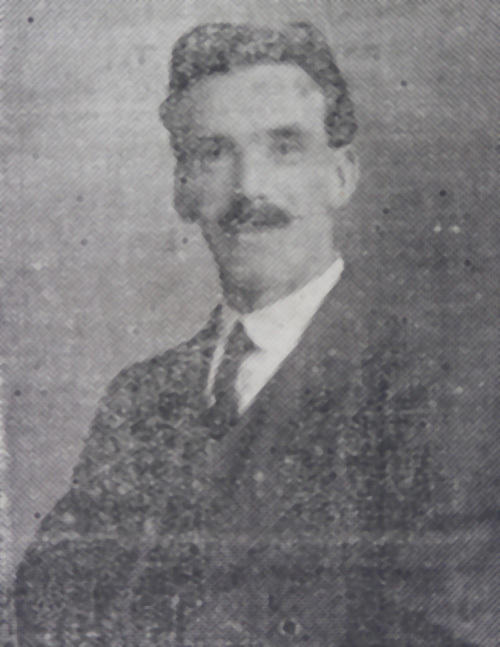 Pomeroy, and at present stationed at Craven Street, Belfast, has volunteered for Kitchener’s Army. He has been accepted for active service on the Irish Guards, and leaves next week for Chesterham for a short training before joining the battalion in France. 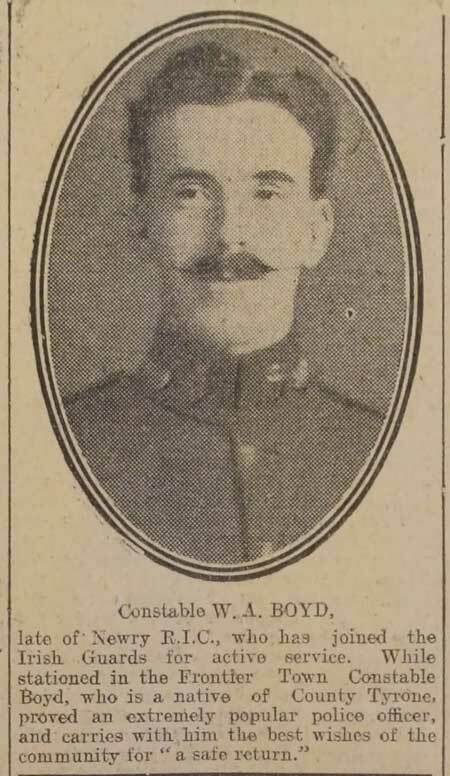 Constable Boyd has nine years’ service on the R.I.C., six years of which were in Counties Limerick and Down, and the last three in Belfast. 03/08/2017 GRONI records from Pomeroy are incomplete so, exact dates can only be speculated and it is possible he was born on 23rd March 1877 and that his mother’s maiden name swas Dolan. 03/08/2017 The 1911 census does not list William as living with the family at house 22 in Moboy, Killeenan. His mother was a widow. 03/08/2017 William Boyd, Police Constable RIC Newry, joined the Newry branch of the Masonic Lodge , No. 79 in 1909. 03/08/2017 It seems his father, John Boyd, died on 22nd February 1907 in the Pomeroy area, aged 68. 03/08/2017 William served in Limerick and Newry as a Police Constable with the Royal Irish Constabulary. 03/08/2017 Lance Sergeant William Boyd was serving with the 2nd Battalion of the Irish Guards when he was severely wounded by shell fire in the attack that followed during the Battle of Loos. 03/08/2017 William Boyd was the son of John David and Eliza Boyd. William was born about 1887 near Pomeroy. 03/08/2017 The 1901 census does not list William as living with the family at house 36 in Moboy, Killeenan, County Tyrone. His father was a farmer. 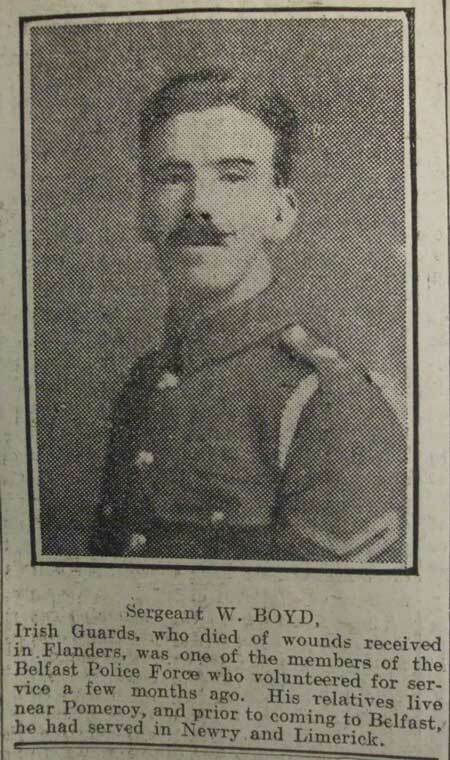 03/08/2017 Constable W A Boyd, late of Newry R.I.C., who has joined the Irish Guards for active service. 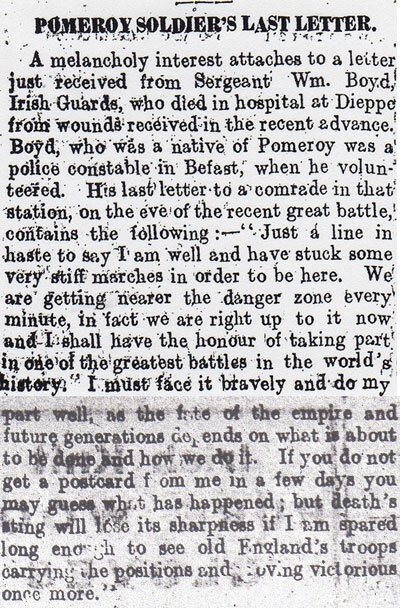 While stationed in the Frontier Town, Constable Boyd, who is a native of County Tyrone, proved an extremely popular officer, and carries with him the best wishes of the community for a safe return. 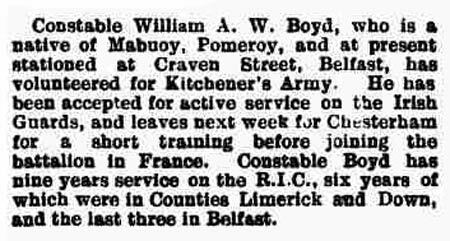 03/08/2017 Constable William Boyd left Newry and was based at Craven Street Barracks, Belfast. 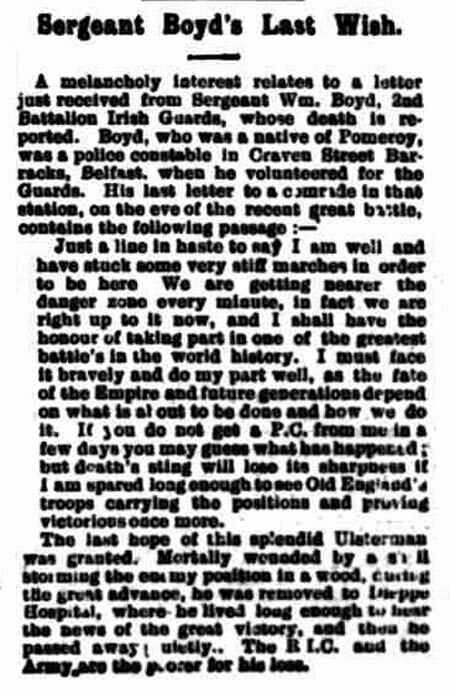 03/08/2017 Sergeant W Boyd, Irish Guards, who died of wounds, received in Flanders, was one of the members of the Belfast Police Force who volunteered for service a few months ago. His relatives live near Pomeroy, and prior to coming to Belfast, he had served in Newry and Limerick. 03/08/2017 William Boyd enlisted with the Irish Guards. His RIC Service number was 61803 and his Guards Service number was 6453. 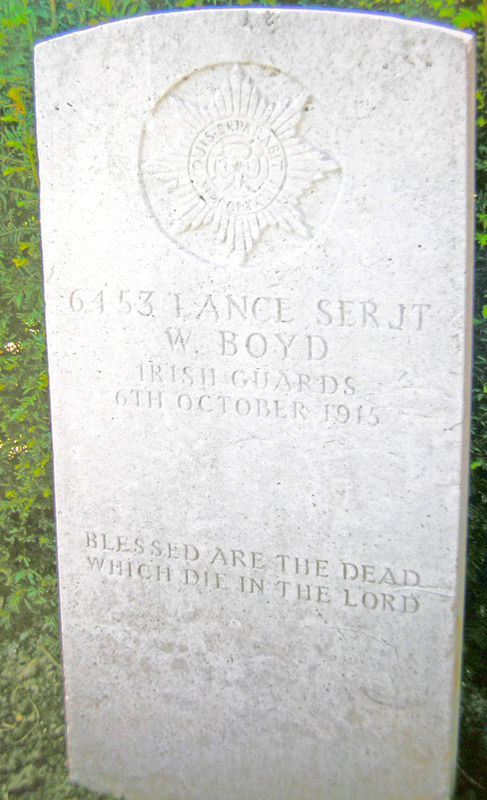 03/08/2017 Lance Sergeant W Boyd is buried in Janval Cemetery in Dieppe in France. 03/08/2017 Lance Sergeant William Boyd was taken to hospital in Dieppe, but he died of his wounds there on Wednesday 6th October 1915.